Wedding gown shopping can be overwhelming. But knowing basic dress silhouettes and body types and also understanding how they flatter your figure will help. Remember: How you feel in that dress is crucial to finding the right fit. Petite, plus or average size, you've got a full bust. Dress dos: Accentuate the positive with an uplifting foundation garment, like a good bra, or a corset. Or minimize your curves by balancing your top with a full skirt. Dress don'ts: Be careful that your dress isn't too revealing -- you want the focus to be on your face. And don't forget to move around in your gown during fittings to make sure everything stays in place. You're built like a swimmer, with wide-set shoulders. Dress dos: Highlight your toned shoulders with a halter neckline, or go for drama in a gown with long sleeves worn off the shoulder. Select a dress with a bodice that highlights your waistline to offset your shoulders and create an hourglass shape. Dress don'ts: Trying to conceal your shoulders is not recommended, as it sometimes produces the opposite effect. Stay away from cap sleeves, which can add width to the shoulder area. You're voluptuous, with a well-endowed bust and curvy hips. Dress dos: Try a mermaid- or trumpet-style gown, which will have a slimming effect. A high-waisted A-line dress with a low neckline also complements curves. Dress don'ts: A slim sheath or slinky bias cut will cling and may accent any extra inches; also avoid spaghetti straps because they won't provide the support you need. Dress dos: Empire-waist gowns are made with you in mind. And a ball gown with a basque waistline, which is a V-shaped dip in the front, will give your waist a nipped-in look for more shape. Dress don'ts: Steer clear of sheaths and dropped-waist styles, which will make you appear boxier. Dress dos: The key word here is elongation. It's best to keep it simple. A column-like sheath or an A-line dress works best: These will keep the eye moving and create the illusion of height. Dress don'ts: Almost all silhouettes will flatter your figure, though a big ball gown or a dress with lots of voluminous fabric may look overwhelming on your small frame. You're five foot ten or taller. Dress dos: Taller women look great in everything from sheaths to A-line styles and full ball gowns. A long veil is great for you because you can carry it off. Dress don'ts: Skip gowns with high necklines because they'll draw the eye upward and create more length. And avoid updos and headpieces that add too much extra height. Short or tall, you're not a fleshy woman. Dress dos: Bateau necklines and sleeveless gowns are flattering options for you. A ball gown is a very feminine shape that will balance out your overall silhouette and visually create curves. Try one with a dramatic cutout back. Dress don'ts: If you're concerned your collarbone is too bony, stay away from portrait, off-the-shoulder or halter necklines. And if you're flat-chested, avoid a bodice with pre-designed cups. You've got a baby bump, anywhere from four to nine months along! Dress dos: Buying a gown while pregnant can be tricky, since you can't predict how big you'll be come the wedding day. An Empire waist is your best bet for its loose structure and relaxed silhouette. For the mom-to-be who wants to show off her belly, a soft, clinging sheath in a stretchy fabric makes a proud statement. Dress don'ts: Avoid anything that's too constricting or uncomfortable, including tight bodices and ball gowns, which will emphasize your middle. You're self-conscious about your arms, whether they're heavy, jiggly or too skinny. Dress dos: Choose long or three-quarter-length sleeves in a sheer illusion fabric, or add a bolero to your look, which can be removed whenever you like! Dress don'ts: Steer clear of off-the-shoulder styles and cap sleeves, which will highlight the upper arms. 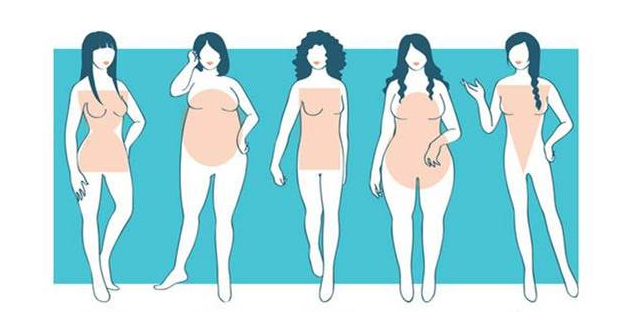 Even though certain styles work best on certain body types, don't let the "rules" narrow your search too much. It helps to try on all different kinds of dresses and then decide what shape and style you look and feel best in.